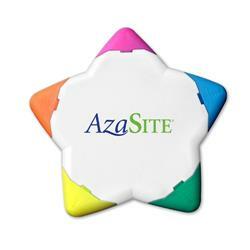 Star shaped highlighters brighten your work day, school day, or trade show booth! Get creative wih 5 different custom highlighter colors!? Our highlighters are unique in that they have special longer lasting ink than others out there.? Use five pointed highlighters to enhance your presentation or spreadsheet.? Another fun promotional product from Adco Marketing! Production Times Available: 5 working days. Dimensions: 4 3/4 in diameter. Typical Imprint Area(s): 2 1/2" x 2 1/2"
Available Imprint Options: $.12 per color and/or second side. Maximum 6 color imprint. Comes with 5 different highlighter colors. 10 per inner bag - 200 per master carton @ 29 lbs.